As the sun in the sky slowly approached high noon, all the fruits had ran out to the playground to begin their much-needed break from school. It was recess time at Main-Squeeze Elementary and this was the time where all the wise fruits would make useful juice-time out of every second they had. Back by the tangerine courts, the Lil Fruityz were huddled around each other, pushing one another to squeeze the best tasting juice. When it came to quality of juice, the Lil Fruityz only produced the best they could. “Squeeze Cit, squeeze!” shouted Twist. “You got it Cit!” joined Wanda Mallon. Wanda Mallon, a ripe piece of watermelon, was the sweetest fruit around. She was polite, respectful, encouraging, and made a juice that tasted so sweet that it would make your mouth dance! Although Wanda is known throughout Main Squeeze for being deliciously flavored, she would sometimes be discourage by how many black seeds she would get in her final product. However, the fruits always reminded her when she was feeling dry that it’s not always about what you can produce in one sitting, it’s about what you accept as your best. Just as the recess bell rang, Twist was still in the process of creating the best juice he could. Like the great pals that they are, Cit and Wanda remained huddled around him until he was complete with his creation. Proud that he finished strong, Twist offered a taste of the juice to his fellow fruits. Each taking a sip, Cit and Wanda instantly revealed expressions of praise. “So sour and so perfect!” applauded Wanda. “Nice squeeze little bro,” added Cit. Caught up in the moment of a good juice, the Fruityz forgot that the recess bell had rang. Now eager to get into their classes, the fruits worried that they might already be locked out of the school! Ever since unwanted pesticides tried to get into Main Squeeze and contaminate all the freshly squeezed juice, Principal Cran-Muffin saw to it to install an automatic door locking system. Although luckily for the fruits, Bizzy Peel had been holding open the door and waited for them. He knew he could get into a lot of trouble for doing that but Bizzy thought they would be safer inside the school rather than out. Bizzy Peel, a tall banana who adored hip-hop, was not your average means of potassium. Bizzy loved and appreciated the art of hip-hop so much that with every sentence he spoke, there was always a rhyme scheme included. “Come on friends, I can’t stand this tension! If we’re caught being late, we’ll all get detention!” yelled the banana from a far. All arriving together at the recess door, the fruits were back inside the halls of Main Squeeze. Not entirely safe yet, the next step was most difficult; get to class without getting seen by Principal Cran-Muffin. Being out of class without a juice pass? 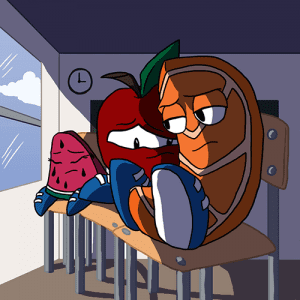 The fruits knew that was an instant after school detention. Something no fruit wanted; especially on a Friday afternoon! So with the possibility of a detention hanging over the young fruits, they decided to work together and safely navigate to the classroom. Knowing that Principal Cran-Muffin would be wandering the halls, the fruits had to be aware, stay out of sight, and juice their way to class without making a sound. “Come on, follow me” whispered Cit to the crew. Taking the lead, Cit cautiously led the fruits through the halls keeping a special eye out for Principal Cran-Muffin. Single file, the fruits moved with stealth and as each second juiced on, they became closer and closer to getting to their class. “There is not much left to go, let’s keep moving,” motioned Twist. “Everybody just keep your eyes open for Cran” urged Wanda. The Fruityz then spun around in great shock to find Ap’Zal standing there with a bright red shine on his face. Ap’Zal’s smile quickly faded when he realized what they were hiding from. Shortly after Ap’Zal’s burst of words, the very muffin they were avoiding was now headed directly their way. The Fruityz were now caught and would find themselves in detention that very afternoon. As the final school bell rang at Main Squeeze Elementary, Cit, Twist, Ap’Zal, Wanda and Bizzy all juiced their way back to the berry wing to begin their after school detention. As soon as the Fruityz arrived at the assigned classroom, they were led in by Principal Cran-Muffin who was disappointed by all the fruits inability to make it to class on time. In an attempt to help the fruits learn from their so called “mistake”, Principal Cran-Muffin told the fruits to position their chairs by the window. After doing so, the fruits waited for further instruction. “Now that you all have your chairs in the right space, I want everyone to look out into the fruitful sky and try to find better behaviors in your futures. I hope that you all will be able to do so.” said the Principal. “Don’t worry Ap’Zal, I guess we were wrong anyway, detention is what we deserve” replied Twist. “Hey, I’m sorry for getting us all caught today fruits…” Ap’Zal apologized. Cit looked out the window for a while and decided to speak his mind. “You know what; I don’t believe that we deserve detention. We’re all good fruits! That’s what our fruit-folks have been teaching us to be! We are good fruits, in a bad place, that’s all” announced Cit. All the fruits in detention seemed to agree with Cit except for one stubborn fruit named Perry Pine, a prickly pineapple. The fruits certainly considered Perry a good friend but not everything he said was so nice; instead his words could sometimes be harsh. “Whether we belong here or not Cit, nothing is gonna change the fact that we’re here. And now we’re stuck” voiced Perry. “So…If we’re looking through windows, why not just squeeze through them!” encouraged Cit. “I’ll go last” volunteered Twist. “Okay Twist but just remember that you’re now in charge of keeping lookout for Cran-Muffin while we’re all squeezing out” informed Wanda. “I’m on it, 100%” replied Twist. ”I gotta do what I gotta do, the trick to getting out is just squeezing your way through!” the banana rapped to himself. Without even the slightest struggle, Bizzy successfully made his way through the window. Next up was Perry Pine, his large pine-apple structured body made it difficult for him to easily squeeze through. But after a couple gentle shoves from the other fruits, he slid right out the window. “Twist how is that hallway looking?” asked Cit. “Clear for now, but we really should hurry” replied Twist. Next out of the window was Cit, and with ease he managed to wedge himself right out. Half of the student’s in detention were now cleared from the room. The pressure of being the last one and the responsibility of being a lookout started to make Twist feel uneasy. He tried to calm himself down by thinking of the great juice he has created already within his short life; that seemed to always help. “Just relax Twist, we’re almost out of here” soothed Wanda. “Be careful Wanda” warned Twist. “I was raised on the mean streets of Fruitzlyn in Orange County, I think I can make it through a window” laughed Wanda. Wanda always had a special connection with Twist, and considered him to be her little brother. As she squeezed out of the window, Wanda shot Twist a watermelon wink for luck. Waiting under the window where everyone squeezed out, Cit waited for his younger brother, he would never leave him behind. “WOO-HOO! It’s my time to squeeze baby!” yelled Ap’Zal. Ap’Zal inhaled and exhaled himself right through the window. When Ap’Zal reached the ground, he saw that Bizzy and Perry has already made their way to the playground and were in the process of making there first glass of weekend juice. He decided to stay with Wanda and Cit as the three fruits anxiously waited for Twist. “When I was squeezing my way through, Twist said he heard footsteps! !” Ap’Zal nervously said. Cit lifted himself up with a sense of urgency so he could quickly help his brother get through the window. Cit apprehensively called out to his brother. There was no answer. Cit restlessly looked through the window and scanned the entire room. His brother, his best friend, the person who always watched out for him was gone! Cit’s mouth opened wide with disbelief.